Check here for important updates about what is going on at Jalup! A bug was found on the Android version of the app. Where if you rotate the screen just as you are ending vacation mode, it adds 50 years to all your reviews (technically 18,003 days). This will be fixed in the next Android update. As well as the ability to restore your XP points on an import. Your xp points are still currently saved the way it is now, but it just isn’t importing it yet. If for some reason you trigger this bug, you can subtract around 18,003 days from Column C in order to get back to your previous numbers. Just make sure to remove the +0000 first from Column C, then create a new column with a formula of =C1 – 18,003. Put this on all rows in this new column. Then move this column in place of column C, deleting the new temporary column just used. Then import. 1. Tutorial System Added to guide new users. Current users on this update will have tutorials in “finished” mode by default. You can restore a tutorial by resetting a deck. 4. New Setting: “Very Long” added to intervals. 6. New Users now get an intro splash screen to help guide them where to start. Almost finished with a very large Android update and a minor iOS update. It took a bit longer than expected. – You can now tap on cards from Search or Today’s Learned & Reviewed to access the actual card. – In order to copy and paste a sentence from Learned & Reviewed, you now have to tap and hold for a second. – Search shows more clearly that “All” and “Owned” are buttons that can be pressed. – Spread out icons on home toolbar to make access to them easier. Study time (the amount of time you spend learning/reviewing each card) wasn’t adding properly. This caused your “Total Study Time” on Lifetime Totals to occasionally go down instead of up and to incorrectly report to your actual total study time. If you feel like you have studied a lot more in total than this number, this was the reason. From this fix, all time will be accurately added. This didn’t affect the intervals or due dates of your reviews – only your app use time. Big Android Update for 1.1.4 released! – Added in an “Accuracy Checkmark” that displays as green when a card’s accuracy is above 75%, and white when below. Jalup iOS 1.3.2 and Jalup Android 1.1.3 released! First simultaneous release of the same feature, and it should make life easier for everyone. It removes the import requirement that the rows of the backup and current database be the same. This allows for more flexibility with editing and uploading your import. Please note that if your row count is different, it will take longer to import (because it is analyzing the whole database against your .csv. But as long as you have a full row of data, you can add as little or as many rows of data as you want at once. – Fixed issue where under Lifetime Totals, Learned was also being Added to Reviewed. – New Setting: Trickle vs Once Daily. Control how your due reviews come in. – New Setting: Vacation Mode. 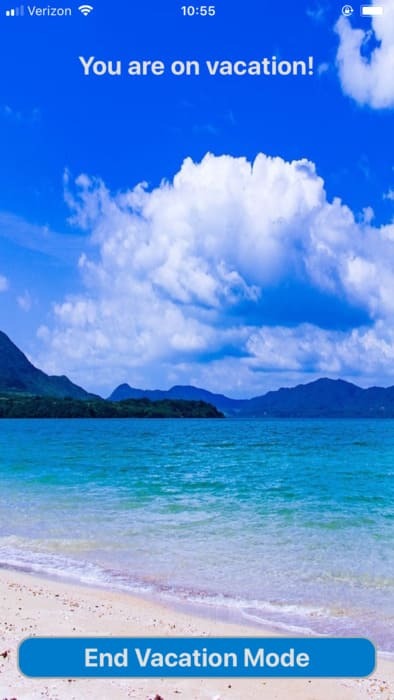 Take a vacation without worrying about a mountain of reviews due on your return. Jalup Champion Stage 2 released and sent to all people who supported it through the pre-order. If you made a pre-order and did not receive it, please contact me. It will be available for sale on the site sometime next week. Had a medical emergency. I apologize for any delays this may cause. There is a new release ready for iOS and Android waiting that add some cool new features. I will release it as soon as I have the time to handle any issues that might possibly arise from the update. Jalup Champion Stage 2 is nearly finished but I still need to run a final check on the furigana. Jalup Next to Jalup app conversion requests may be answered several days late. Everything will be back to normal soon, but I appreciate you waiting. As promised, it is a big update. It includes the immersion player found on the iOS version. Listen to and shadow all of your cards, at any time. 2. Jalup Android 1.0.9 released. This is another minor update release. – Allow for purchase of Maximum even if you’ve already purchased a lower deck first. – Fixed issue that was showing some users as offline (making them unable to make purchases) when they were online. 3. Currently working on porting over one of the biggest features from the iOS version to the Android version. It has taken a long time to get it working well, which is why there has been a delay. – New feature: User notes. 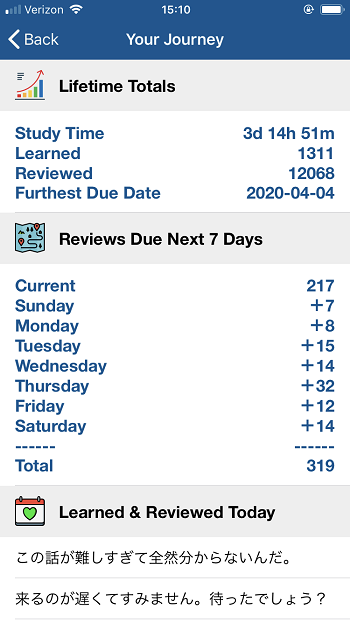 From the checkmark in Learn or Review, use the note button to add whatever you want to your cards. This is saved in your progress, so from your backup sheet, your notes appear and are editable there. HTML input is allowed. 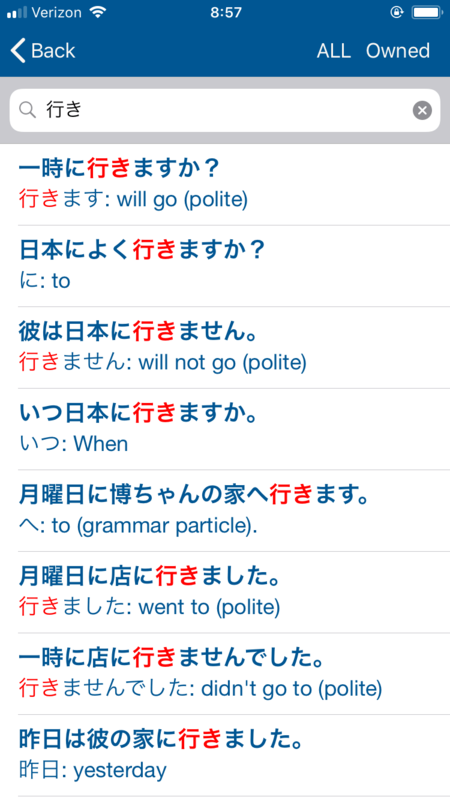 – Bug fix: swiping on combined reviews from a Kanji Kingdom card to non-Kanji Kingdom card carried over the kanji keyword. Jalup Android 1.0.8 Released – I wanted this to be a feature release, but there were a few issues I had to deal with first. – Fixed an issue affecting some users who were trying to use the app without an internet connection, and having the app crash on them. If you try to access purchase/restore without a connection, you will also get a warning message now. – Fixed an issue where an import with a mismatched row number caused the load message to get stuck. – Added Jalup Expert: 1,000 new J-J cards with native audio continuing off of Jalup Advanced. Pre-orders for Jalup Champion begin. Android: the Expert update (similar to iOS) is near completion. Expect it sometime soon. It’s been about 3 years since I’ve updated the design of the Jalup blog , and I thought it was time to simplify things. Remove the distractions, focus on the content. I hope this improves everyone’s reader experience! 1. 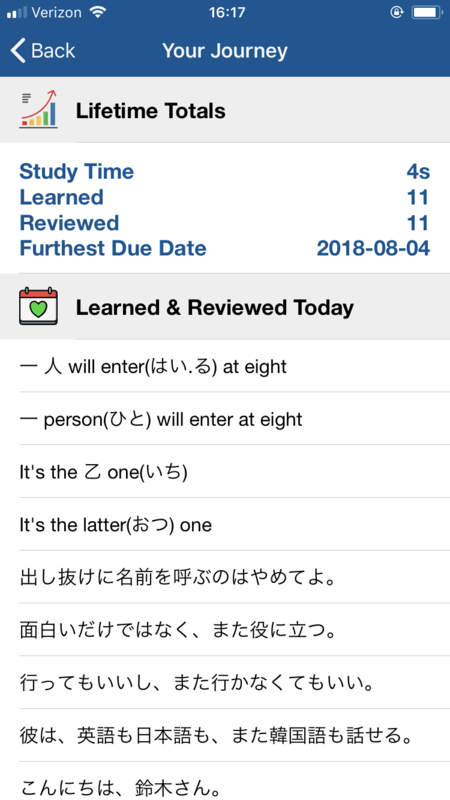 Card Freeze: prevent a card from appearing in learn, review and listen (access from white check mark). 2. 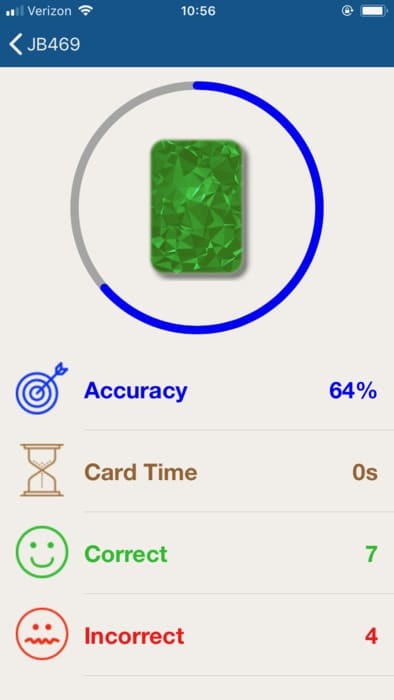 Card Star: mark a card so you can return to it later (access from white check mark). 5. And other small minor improvements! Earn experience points through learning and reviewing cards and level up! Your level and experience points are shown on the home screen with an evolving icon. Jalup for iOS – v1.1.8 released finally! There is one small issue to note. If you want to get the maximum package (regardless if it is a first time purchase or an upgraded purchase), you need to update the app to the newest version 1.1.8. Older versions (1.1.7 and less) that try to download the maximum package may crash upon download (because it would be trying to add Expert from Maximum when Expert doesn’t exist yet on the app). I will prevent this from happening the next time there is a deck addition (to account for those late on updates still wanting Maximum), but I only discovered this issue after I already released everything live, and there is no way to go back for 1.1.8. I apologize for any inconvenience this may cause. *Jalup Expert for Android will be coming a bit later. The holiday sale that has been going on for December will probably run until the first week of the New Year. – iOS version 1.1.7, a bug has been found where if you are in listen mode, and you have the screen off (the lock screen on), the tracks will occasionally skip. This has been fixed, and will be available in the next update (1.1.8) at the end of the month, which will also include Jalup Expert. I would release this bug fix earlier, but there are no updates allowed on the App Store between 12/23-12/27, and just in case this fix causes some kind of other strange behavior, I want to be able to address it immediately. Thank you to the person who pointed out this issue! Not sure how long it has been around for. 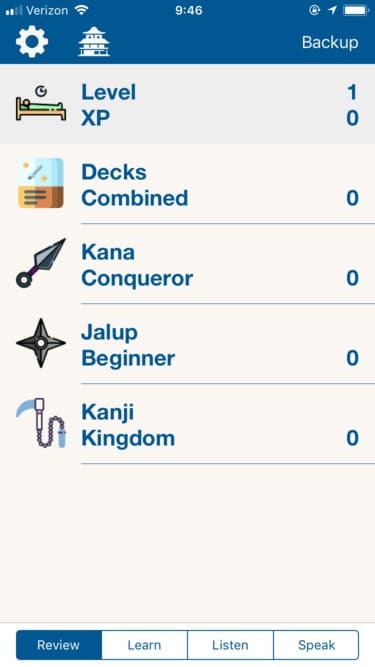 The next update for the iPhone version will include Jalup Expert, and an automatic (one tap) way to upgrade your Maximum deck to include Jalup Expert. Setting this up has taken a little more time than I thought. It will most likely be released by the end of the month. Things are progressing smoothly with Jalup Expert development for the Jalup mobile apps. And yes, it will be included for free if you have already purchased Jalup Maximum. Jalup Android 1.0.2 released: Added in two new audio settings: auto-play for learn and auto-play for review. Jalup Android 1.0.1 released, fixing repeated tap issue, and adding in setting to adjust your review intervals. 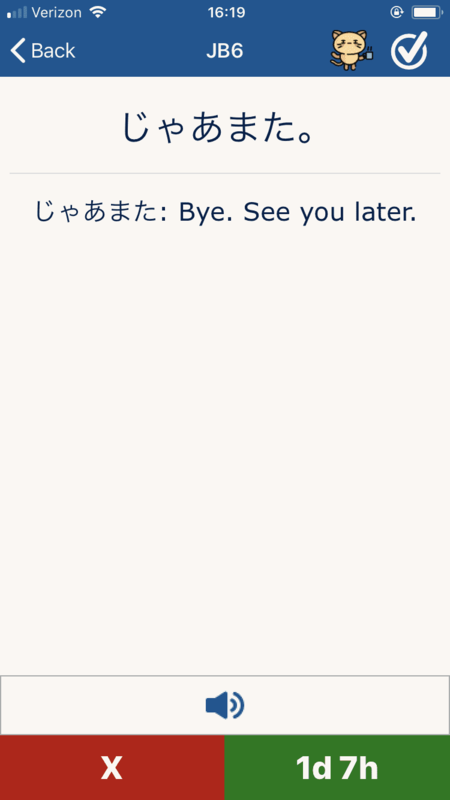 There was an issue with comments on the Japanese Level Up blog today. If any of your recent comments seem to be affected, or if there is any strange comment behavior, let me know! New landing page for Japanese Level Up to hopefully explain Jalup a little better to people unfamiliar with it. The blog and all of its posts will continue to run the same. But you’ll need to update your bookmarks to https://japaneselevelup.com/blog. The Jalup App is now available for Android, live on Google Play! Jalup iOS v1.1.7 has been released. This has some minor improvements, and fixes some of the card linking issues reported by users. Jalup Holiday Sale Starting Now! *The Jalup App for Android will be finishing up beta shortly and will be available at the above introductory prices upon release. If you’ve seen the most recent post, you know that I’m very excited to announce the Jalup Android version beta testing starting. Another piece of good news. You can now fully transfer your progress from Jalup NEXT to the Jalup Mobile app, on either Android or iPhone. In order to do this, you’ll need to e-mail me a request, and provide me the e-mail of your Jalup NEXT account. I’ll send you a .csv file of your Jalup NEXT data. Then you just need to follow a few simple instructions which I provide, and you’ll be able to upload it directly into the app! 1.1.6 update release fixing the critical bug discussed below. Please update to this. Thanks to Apple for the super fast response time! Also I’ve been made aware of the typo on card JB11, where in the definition the word すみません is replaced with おはよう. I think because it’s such a simple card that most people didn’t bother saying anything. It will be updated in the next version! You will experience this bug if you have finished any deck (ex. 232 kc cards or 1000 JB cards), and have never set a goal for these decks. I am very sorry for not spotting this issue on the last update. I’ve already implemented the fix, and uploaded it to the App Store through v 1.1.6. However, it can take a few days for the App Store to approve an update. 2. Open up the .csv file in Google Spreadsheets as an editable spreadsheet. You may be able to do this with Excel as well, but Google Spreadsheets works the best. 5. From inside the app, go to Backup > Import > Select this .csv you just exported. Note: for those of you who tried deleting the app and reinstalling it and get the error “Error: Your backup must match your current owned deck count…” You must first restore all the purchases you have before importing the .csv. So if you have had Jalup Maximum, you must first restore Jalup Maximum, then import. If you had KC and JB, you must restore each of those individually and then import. You will only need to restore these purchases if you tried to fix the issue by deleting the app and reinstalling. 6. Assuming you followed everything above, you will be able to tap Learn or Listen, which was crashing for you before. The decks that you have finished will show 1 card left to do (since you edited them). If you can hold off on that one card until 1.1.6 is available, then you don’t need to do anything else. Just make sure not to learn the final card or the bug will return. 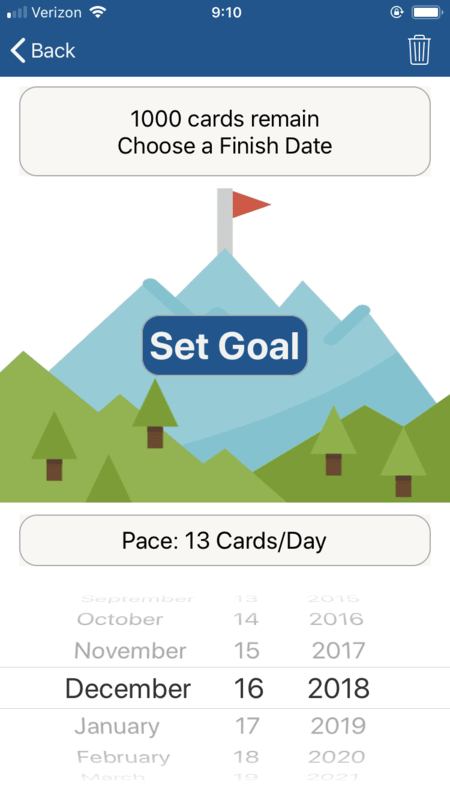 If you really want to proceed through that one card, you need to swipe left to set a goal on that deck. Set any date. Return back to learn. Then learn the final card. The goal will be completed, and the card will be back in your reviews. You’ll need to do this set goal/complete final card for each deck that has one card remaining. Once 1.1.6 is out, you won’t need to do this. Again, I apologize for missing this issue. If you have any problem with the above steps or something still isn’t working right, please e-mail me. Fixed an issue where setting a goal and then finishing the deck where the goal was set caused the app to crash when trying to enter Learn or Listening mode. – New Search Feature! Search through all your owned or learned cards, or through specific decks, and have your results displayed in an easy way to compare how a word is used in different sentences. – Add help message in Jalup store, which explains what to do if a download didn’t work. 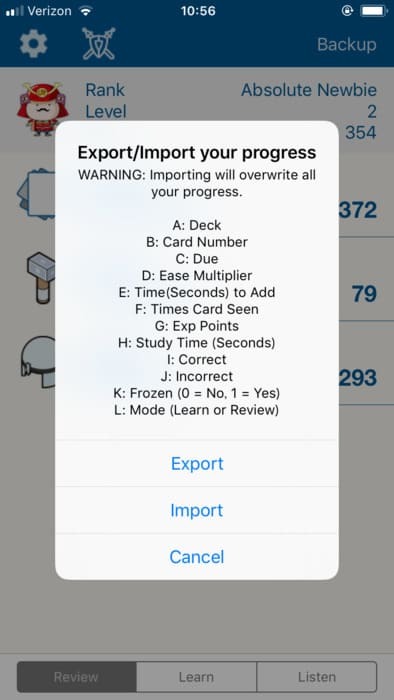 – During reviews, removed the alert that told you when you finished reviewing your cards and now are going to go back to the cards you marked with an X. This got in the way more often than not, and was more annoying than helpful. Once you finish all your base reviews, your marked wrong cards will just be displayed. – Minor xp boosts for various actions within app. – Resetting a deck now resets the tutorial, so you can repeat a tutorial. Jalup App 1.0.9 released. 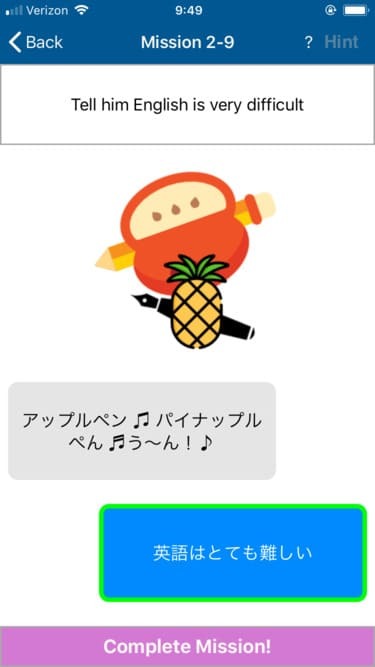 Stories and Situations now included within the app! I created some new visuals to explain how the Jalup learning system works, because sometimes it isn’t the easiest thing to figure out what is going on with the method. This can be seen on the About page and the Store page now. Jalup App 1.0.9 is about 80% finished. And with it will come Jalup Beginner Stories, Jalup Beginner Situations, Jalup Intermediate Stories, and Jalup Intermediate Situations. There will be plenty of samples for free users, and all of it will be included if you buy (or already bought) Jalup Beginner or Intermediate. Jalup 1.0.7 Released – Critical bug fix for Jalup App. An issue was causing the app to crash when some people tried to export their progress on an iPad. Everything should all be good to go. This is a minor update, with a lot of small improvements that will help things run faster in the future. I also fixed some coloring issues, a few small lingering bugs, and fixed the giant tutorial images stretching on the iPad version. Check out the details in this explanation post. 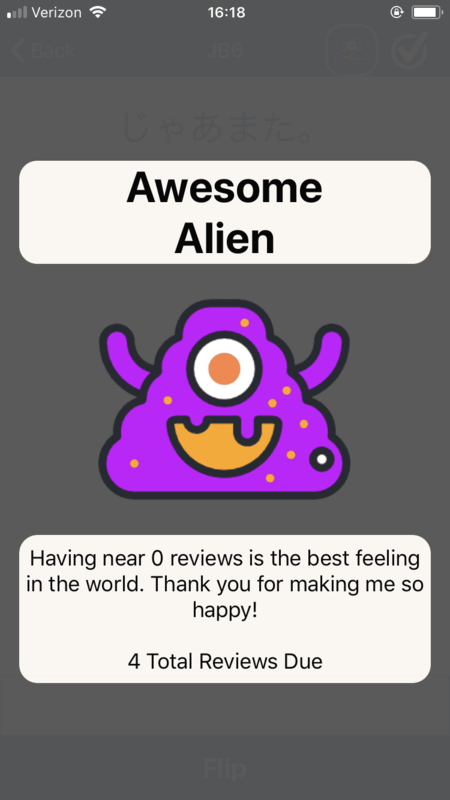 Jalup 1.0.5 is just right around the corner and it will introduce some new features I’m proud of: User Stats, Daily Roundup, and Review Monster. Jalup Expert is currently in the works for both the Jalup App and Jalup NEXT. As I mentioned before, linking it is a painfully slow process, but it is in development now! Jalup 1.0.4 released! With it comes Jalup Intermediate, Jalup Advanced, and the Jalup Maximum package. The Jalup Store and the way all the products across the 3 platforms has gotten too bloated and confusing, so some major changes have been made. Both pricing and product line have been reformed. 1. Individual Anki stages (in groups of 250) have been completely removed. The only purchase option is now for a full level, which includes 1,000 cards. If you were in the middle of buying individual stages (ex. you bought stages 1 and 2 of Jalup Beginner and need to buy the remaining 2), you will be able to purchase the remaining stages individually. Please send me an e-mail and I will provide you the remaining links. 3. Anki level packages have all been dropped down significantly in price to $99.99. This is to account for the bonus items being removed, the individual stage option removed, and the fact that Anki requires the least maintenance cost for me. 4. Jalup Expert has been split in half. The first half (1,000 cards) will continue to be called Expert. The second half (1,000 cards) has been renamed Jalup Hero. The split of these 2 is reflected in the pricing. The content has not been changed at all. 5. Jalup Immersion (stages 1-5) has been renamed Jalup Master, as it is a direct continuation off of Jalup Expert/Hero, and has confused people with its name. The content remains the same. 6. Jalup Maximum still remains exactly the same, and includes everything at the same price. Jalup Expert is currently in development for the Jalup App. This will take longer than Intermediate and Advanced took, but it is coming. This will be followed by Jalup Hero, Jalup Master, etc. 1. As Expert is being developed for Jalup App, it will also be developed for Jalup NEXT. So both will be released at the same time. 2. Jalup Next prices have been increased. This is to account for the rising costs of maintaining Jalup NEXT, and it being the most expensive of the 3 platforms to continue with. Jalup Intermediate, Jalup Advanced and the Maximum package will be included in the Jalup App on the next update (v1.0.4). It’s coming much sooner than you expect! See a detailed post explaining speaking missions and what’s coming soon. – Test your speaking ability with Speaking Missions! – Removed “Level Rank,” because it doesn’t accurately represent the user’s real level. Speaking Missions is taking a little bit longer than expected, but 1.0.3 is coming soon. In addition to this giant new feature, a lot of other small really cool things will be coming with it. 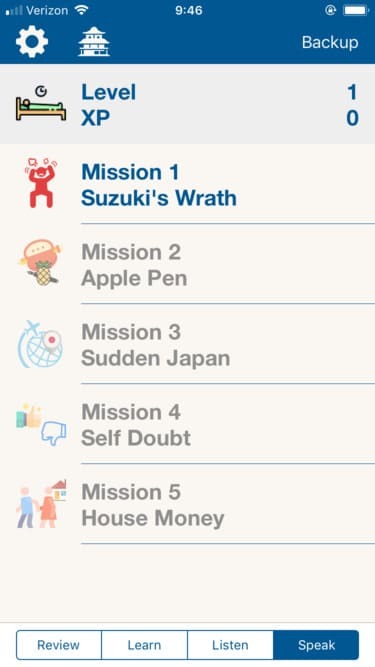 Jalup app 1.0.3 is going to introduce a really cool new feature called Speaking Missions. It’s going to be a way to interactively practice your speaking ability from what you’ve learned from the decks. – Kanji Kingdom – the 2300 cards that will help you master the kanji – has now been released. Jalup mobile app released for iOS! What is the Jalup App?